Hikvision has participated at the third edition of the Fire & Security India Expo (FSIE) 2019. FSIE Expo 2019 was held between 28 February - 2 March, 2019 at Hall 4, Bombay Exhibition Centre (BEC), Mumbai as a part of the Build Fair Alliance along with ACREX 2019 and ISH 2019. The event also hosted the FIST Awards ceremony on 28th February. The FIST Awards are annual awards initiated by Fire & Security Association of India (FSAI) and powered by Hikvision. The awards recognized the extraordinary contribution of End-users, Government Organizations, Original Equipment Manufacturers and individuals in the security, safety, fire fighting and emergency response categories. At the event, Hikvision showcased a series of latest and most advanced technological innovations with AI Technologies, the signature DeepinView Series IP Cameras and DeepinMind Series NVRs. It also featured live demos of AI based applications for Face Recognition, People Tracking and Perimeter Protection. Safe City System structure with AI Cloud architecture was displayed. 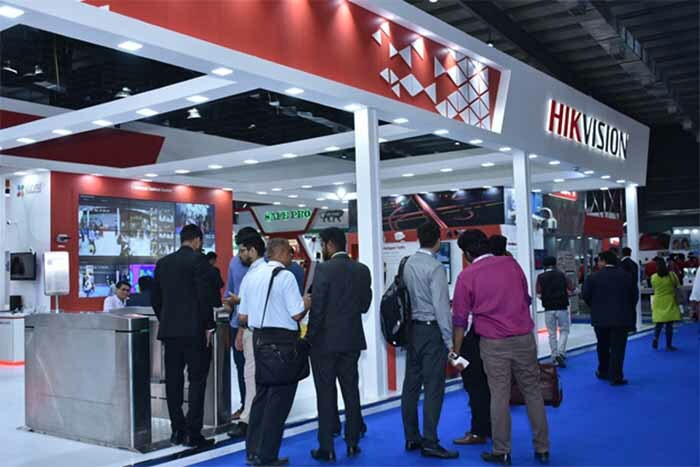 Hikvision had showcase a whole new range of vertical specific solutions, including Specialized Applications, Intelligent Traffic Management Solution (ITMS) and Mobile Enforcement Devices (Body Worn Cameras). Hikvision also displayed the latest range of professional IP Cameras, Intrusion Alarm System, Pyronix Cloud and Home control Applications, Video Intercom System, EZVIZ Smart Home Cameras, Under Vehicle Surveillance system (UVSS) and Face Recognition Turnstile were on display. The wide range of Hikvision products got good response from the system integrators and end-user community. K. P. Dominic, President, FSAI, Pankaj Dharkar, International President, FSAI, Ashwin Ijantkar , Mumbai Chapter President , FSAI and Trilokinath Tiwari , Chair Security, FSAI hosted a thought provoking BIG3 Conference during the FSIE expo. Hikvision had participated in a panel discussion on Security & IoT in Critical Infrastructure. A.L. Narasimhan, Vice President, Strategic Business Alliances, Prama Hikvision India Pvt. Ltd. shared his views on key themes of critical infrastructure security. The panel discussion was led by a distinguished panel, it was moderated by Col. Deepankar Chaudhary, Advisor - Enterprise Security & Risk Management, Caterpillar.